Mike Robinson shares his review of studying with Wealth Within. According to Mike, trading has given him another source of passive income that will never run dry as he grows his share portfolio. He also feels relieved and financially more secure, and he is able to really enjoy retirement. 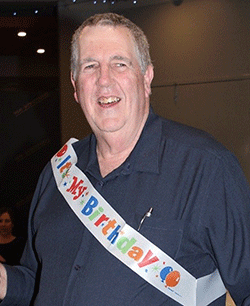 Mike recently retired from working for the Queensland Government after 37 years. He enjoys family events and spending more time with his grandchildren, going on boat cruises with family and friends around the South Pacific, photography, basketball, study and doing scientific research and investigations, as well as writing books. I became interested in the markets from circa 2013 while workinglong hours for the government. I didn’t mind hard work and working long hours, however, I heard that people could substitute their income with share trading. So, to keep a long story short, I wanted to cut down my work hours and spend more time with my family, hence I became interested in share trading. To get started in the market, I went to a financial planner and askedwhat shares I should buy. He gave me a list of eight companies in some different sectors within the ASX50. I bought them but without any knowledge on how to successfully trade the market. Therefore, my portfolio began fading away rather quickly. The consultation wasn’t expensive, but the investments lost money.However, I don’t blame anyone else. I take responsibility for any trades I place. It was clear that I needed to get the knowledge to trade. I then invested in a share trading program based on moving averages that told me when to buy, sell and what to buy, but relying on a computer program to do all the work for me did not bring me success. I realized this program wouldn’t make me money in the long run. Then I found Wealth Within. I bought their Investment Pack and watched the two DVDs and read Dale Gillham’s book, “How to Beat the Managed Funds by 20%”. I enjoyed this so much that I signed up for his Trading Mentor Course. I made about $1,000 from watching the DVDs and reading Dale's book. I made a few thousand from the Trading Mentor Course and decided to keep rolling my profits into more courses to build my knowledge. Less than a year later I enrolled in Wealth Within’s Diploma of Share Trading and Investment. This has turned my trading around and paid for a boat cruise, with a balcony. I am now about to commence the Advanced Trading Strategies Course through Wealth Within, and I am not going to stop there. I also intend to complete the Forex and CFD Trading Course. How have you been able to learn and educate yourselfabout the markets? As stated, through studying the above courses, and attending workshops. There’s nothing like experience and putting it into practice in the market. Plus, I’ve applied what I learnt to trade the market. Have you got several hours? The short answer is, absolutely. Mybiggest mistakes were not using stop losses, not trading stocks trending up long term, trying to pick tops and bottoms, being head strong, letting my emotions take control of my trading, acting on tips from family, friends and associates and not using trend lines. The one I found most important, was not getting an education onhow to be a successful trader early enough. I just dove straight into the market and lost money. Would you define yourself as a discretionary trader, amechanical trader or a combination of both? I trade as mechanically as I can, using written trading rules in mytrading plans. I apply the art of trading as well to get the most out of every trade I place. When my plan says to buy, I normally wait till the afternoon todetermine which way the market is going and buy with the smart money. I will have a number of different strategies tested and I work out which one is most appropriate depending on what the stock is doing at the time. Most importantly, I wait for confirmation. I learnt this the hard way. Dale Gillham, Janine Cox, Kathy and Shane from Wealth Within. Jeffrey Kennedyon Elliott Wave theory. Warren Buffett on trading the market, Mark Douglas on the Disciplined Trader, Jeff Cartridge & Ashley Jessen on CFDs, Karl-Erik Warneryd on Stock-Market Psychology, Robert Kiyosaki, the author of Rich Dad Poor Dad and Dan Lok on business. They have all had an impact on my development as a successful trader/investor/business person, and in making me more profitable. I have a process. It begins with a scan of the top 200 shares usingthe market analyst software. I note the shares I like. To find them I just look for an uptrend. My preference is to see an uptrend of at least three years. I complete a written trading plan for the shares I have on my watchlist. I back test those shares over the last 10 years on both monthly and weekly charts. I document my share trading plans, including detailed rules for entry and exit of the stock. Another important step is to record on my share charts where I think these shares might trade to. I mark two potential levels above the current price action and two below. Doing the back testing gives me confidence. Is there any one trade (win or loss) that had a profoundeffect on your development as a trader? If so, what did you learn from the trade? I had two trades where I made a 40 per cent gross profit in under 12months and this had the profound effect of boosting my confidence. I used the rules I was taught at Wealth Within. For these trades it was a stop lossand trend lines. A couple of other profitable trades made around 11 per cent and 13 per cent profit in under 10 weeks, but I then lost the money on Billabong [70 per cent loss] because I didn’t set a stop loss. At that time I was trading without any share trading education behind me and this was an expensive lesson. When you start trading without a proper education you never really understand the cost in time, money and opportunity. Would you classify yourself as a short-term or a long-termtrader? What advice would you offer to people getting started as traders on the relative merits or otherwise of each? I hold positions for 3 to 12 months, so medium term. My advice is: do fewer trades and you’ll make more money, and above all, you must have rules and make sure you stick to your rules. People are worried they are not going to be successful. They justhave to get into it, give it a go and do the analysis. The thing is, you can send in your analysis to Wealth Within to have it checked before you trade or while you are trading. I’ve found that doing the figures and the analysis builds my confidence. Knowing how to back test to determine the rules to trade with and putting the trades into the market also gives me confidence. What markets do you trade and which markets do youprefer? Do you have a favorite, and why? I trade the ASX and prefer the ASX200 because these ASXcompanies are quite liquid, so I can get in and out of trades quickly and not get stuck in a trade. I have been stuck in lower liquid stocks before and it was not agood place to be. I found I couldn’t get out when and at the price I wanted, which leads to a loss. This experience was negative for my psychology and this doesn’t get me motivated. What makes your trading style different from others? Whatsets you apart from other traders? I think there are a lot of people out there who don’t use proper rules,so this is where I’m different. I use solid trading rules, including trend lines, Dow and Gann entries and exits, stop losses and I back test the strategies. I also complete a written trading plan, plus I use proper moneymanagement and all of the other things I have been learning. So you could say I am different as I have a solid process and methodology. Do you have a favorite trading rule? I’ve found that trend lines applied properly, to the five golden rules,works well for me. I use them in up trending, long term markets. Ed Seykota says, “Everybody gets what they want from themarkets.” What do you ‘get’ from the markets? I make money that pays for nice things like boat cruises and luxuryitems for around the house like TVs, Home Pods, Home Theatre etc. You could say I get to enjoy the fruits of my labour, as not only do I enjoy trading, it enhances my lifestyle and that of my family. It has given me another source of passive income that will never rundry as I grow my share portfolio. I don’t need to tap into my capital, I spend only my derivative income from trading. So how has this effected my lifestyle? Well, you could say other than the above, I can do what I want and live without the pressures that most in retirement seem to have. I feel relieved and financially more secure with another source of income to tap into. What books, seminars and courses have you read orattended and which would you recommend? I would recommend the books and DVDs by Jeffrey Kennedy on ElliottWave theory. Warren Buffett on trading the market, Mark Douglas on the Disciplined Trader, Jeff Cartridge & Ashley Jessen on CFDs and Karl-Erik Warneryd on Stock-Market Psychology. Seminars I would recommend include the Trading Workshopsheld by Wealth Within, which have accelerated my trading wealth creation. Courses I would recommend are the Investment pack, which comprises two DVDs and a book by Dale Gilham, the Trading Mentor Course and the Diploma of Share Trading and Investment. I have completed these and apply all of the knowledge from these courses to the betterment of my trading. More boat cruises, overseas air travel, more time with the family, more luxury items for around the house and having my share trading benefiting my family and my lifestyle, but not becoming my life. I live to enjoy life, not solely to trade.